Bernie Sanders is a presidential candidate for the Democratic Party. Currently serving as the junior senator for Vermont, Sander’s political career has spanned over three decades. He states he is a secular Jew that does not subscribe to an organized religion. His political career has coincided with his activism, in particular his support of the Civil Rights Movement. The seventy-four year old was born and grew up in Brooklyn New York. He attended Brooklyn College for one year, before transferring to the University of Chicago. Graduating in 1964 with a bachelor’s degree in political science. Sanders then returned to New York where he lived until 1968, before moving to Vermont. During this time Sanders, met and married his first wife, Deborah Shiling, the two married in 1964 and divorced in 1966. Sanders then began a relationship with Susan Campbell Mott and had one son together, born in 1969. Sanders ended up marrying Jane O’Meara in 1988, becoming a stepfather to her three children. Bernie Sander’s father was a first generation immigrant from Poland, moving to the United States in 1927. His mother was born in New York in 1912, with family remaining in Poland and Russia. Both of his parents came from a Jewish upbringing. When he was younger Sanders became interested in politics after learning about the devastation that happened during World War II. With members of his mother’s family remaining in Europe and Russia were killed during the Holocaust. Sanders has said that his family was happy to be Jewish, but rarely attended services. Sanders currently claims his Jewish heritage, but says he is best described as a secular Jew. During his political career, and in particular his 2016 Presidential candidacy Sanders has downplayed his religious affiliation and has stated he is a follower of God but does not subscribe to any one organized religion. Sanders continued to advocate for racial equality and in 1963 attended The March on Washington For Jobs and Freedom. The summer of 1963 Sanders was charged and declared guilty of resisting arrest during a protest against segregation in Chicago. A proponent of the anti-war movement, Sanders applied for conscientious objector status during the Vietnam War. His request was denied, but by that time he had aged out of draft status. Despite his pro peace sentiment Sanders has continuously been supportive of Veterans. Beginning with his elections to student organizations while at the University of Chicago, Bernie Sanders has been active in politics. After he moved to Vermont, Sanders joined the Liberty Union Party and made two unsuccessful bids for Governor. He followed those up with another two unsuccessful bids for Senate seats for Vermont. Following his attempt in 1976 to become Governor, Sanders retired from the Liberty Union Party. In 1980, Sanders began a successful campaign for mayor in Vemont’s largest city, Burlington. Serving three terms as Mayor, Sanders often described himself as a Socialist. His tenure as Mayor brought revitalization to downtown Burlington, as well as major improvements to the waterfront. His work helped to boost Burlington and it remains ranked as one of the best places to live by many. Following his mayoral term Sanders taught at Harvard University in 1989, and at Hamilton College in 1991. Bernie Sanders served as a Representative of Vermont in the House for 16 years. In 1991 he became the first Independent to win a House seat in forty years. His first few years as a Representative found Sanders butting heads with colleagues on both sides of the aisle. He criticized Democrats and Republicans as working for the wealthy. His first eight years in the House he chaired the Congressional Progressive Caucus, which he helped to co-found. He originally voted against a bill that required background checks and waiting periods for firearm purchases. He also voted in favor of the Violent Crime Control and Law Enforcement Act, citing the inclusion of the Violence Against Women Act with the original bill as a key reason for his support. He opposed the resolutions for use of force in Iraq in 1991 and 2002. He was also against the 2003 invasion of Iraq by the United States. Sanders often voiced his disagreement with the Patriot Act and voted against its creation. He continued to advocate against the government’s bias towards the wealthy, going so far as to vocally criticize chair of the Federal Reserve, Alan Greenspan. In 2007 Sanders was elected as the Junior Senator for Vermont and was considered to have the third highest approval rating in 2011. His continued his criticisms of Congress favoring the wealthy throughout his senatorial tenure. Voting in opposition of the extension of former President Bush’s tax rates, Sanders delivered eight and a half hour speech which thrust him into the spotlight as many encouraged him to run for President in the 2012 race. Beginning in the spring of 2015, Bernie Sanders voiced his candidacy for the Democratic nomination for President. Officially kicking off his campaign on May 26, 2015. Refusing to accept donations from Super PACS, Sander’s campaign stuck to what it calls a “grassroots campaign” which has taken the form of small donations from ordinary citizens. Within twenty-four hours of his announcement, Sanders, was able to raise 1.5 million dollars, and to date has raised over 93 million dollars. While running on the Democratic ticket, Sanders has declared himself as a Democratic Socialist and became the first candidate to win a primary, in 2016. His campaign has featured Sanders describing his views on Democratic Socialism, and many have noted his consistency in political ideals since his political career began. Sander’s has gain wide spread support with his policies focusing on wealth inequality, income reform, universal healthcare and student debt. He has also come out in support of the LGBT community as well as women’s reproductive rights. Sanders has been vocal about prison reform and has spoken against institutional racism. His campaign has utilized a variety of social media platforms while also maintaining more traditional modes of campaigning, such as television and radio spots. In late 2015, Sanders received an endorsement from hip-hop artist, Killer Mike. The two have created a series of videos that have shared heavily on social media sites. Additionally Sanders has seen a swell in the support from young adult voters, who have adopted the saying, “Feel the Bern” as a play on words when someone has been insulted. Bernie Sander and his staff have often used the phrase, “Political revolution” as a description for the campaign. 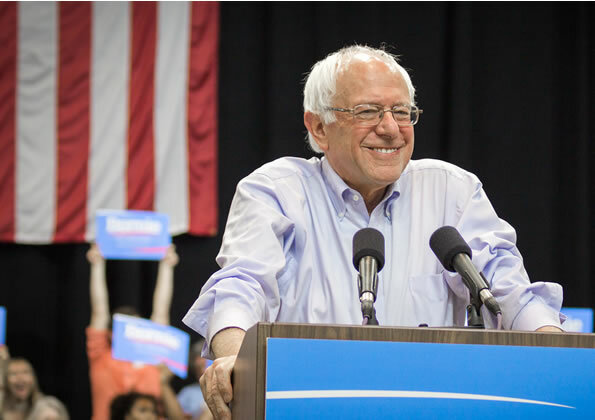 This revolution features Sanders advocating for a raise to minimum wage, a federal legalization of marijuana, free college education as well as a reduction in student loan interest. For many young adults overburdened with debt and working low paying jobs, Sanders promises have contributed to the candidate’s widspred support. Bernie Sander’s grew up as the son of Jewish parents, living in Brooklyn New York in the years following World War II. His interest in politics began at a young age and have continued to shape him even today. As an activist in support of Civil Rights, Sanders participated in the first sit-in in Chicago’s history. His dedication to political reform has spanned his entire career and often put him at odds with his collegues in the House and Senate. His current Presidential bid features a grass roots approach with financial support coming from small individual donations. His campaign has placed attracted many young adult supporters, through its use of social media platforms and endorsements from a variety of people, including Killer Mike. As a Democratic Socialist, Sanders has spoken out against wealth inequality, institutional racism, and police brutality. It remains to be seen if Sander’s campaign will be able to overcome his current rival, Democratic Presidential Candidate Hilary Clinton.